Karnataka chutney pudi or spicy dal chutney powder is a very tasty, convenient accompaniment for any meal. You can make this South Indian chutney powder once and use it for months to make your meal interesting. This spicy lentil powder is known as Chutney pudi / chutney podi / dal chutney powder / pappu podi in different states in Indian. Chutney pudi is also known as 'gun powder' as it is made very hot and spicy in some homes. In my home we make it medium hot spicy. It is basically a South Indian recipe and there are some variations too. Chutney podi retains freshness for 2-3 months or longer when ingredients are roasted properly. So you may make in larger quantities and use for many months. Store in an airtight jar and take out in a smaller jar/bottle with a dry spoon. Chutney pudi can be served with plain rice, chapati, poori, dosa, idli, uttappam. You may sprinkle it on bread to make a sandwich too. Step1 - Heat a pan/kadai on medium low heat. 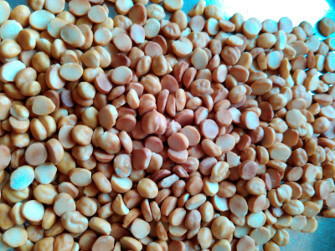 Roast chana dal on low flame till you get roasted aroma and dal is light pink. This may take about 8-10 minutes. To test, take a dal grain out, cool it and bite into it. If it is crisp, it is done. If it is soft, you need to roast longer. But take care not to over roast or burn. Dal should not blacken. Pour out chana dal on a wide plate and leave aside to cool. Step2 - Roast urad dal on low flame till it is light pink. This may take 4-5 minutes. Pour out urad dal on the plate with chana dal and leave aside to cool. 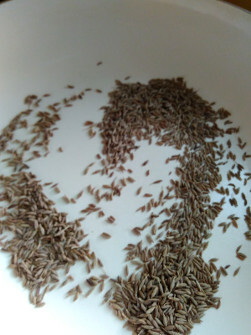 Step3 - Roast jeera/cumin seeds on low flame till you get roasted aroma. This may take about 2 minutes. Take care not to burn. 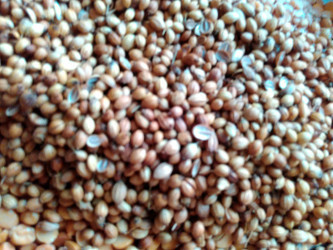 Step4 Roast coriander / dhania seeds on low flame till you get roasted aroma. This may take about 3-4 minutes. Take care not to burn. 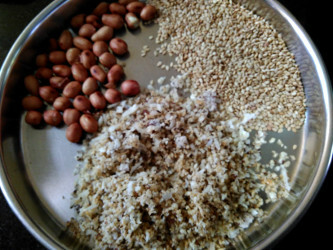 Step5 - Roast sesame seeds, grated kopra and peanuts separately on low flame. You can see roasted til, kopra, groundnuts in the image below. I do not remove the peanut skins after roasting. Step6 - After roasting, let all the ingredients cool down to room temperature. 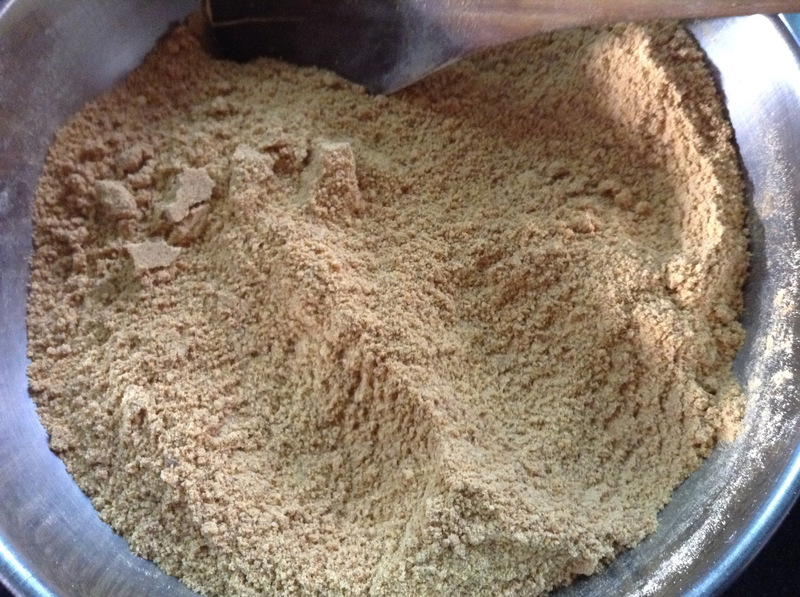 After that we start the grinding process of chutney podi. Grind the dals together to a rough consistency. You may need to grinding in batches, depending on the size of your mixer/blender/grinder and the quantity of chutney pudi you are making. 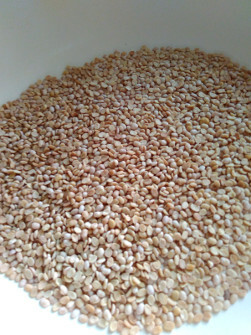 Step7 - After all the dal is ground roughly, grind the spices together along with salt, jaggery and tamarind(if using). Grind this to a find consistency. Now add some, about 1/2 cup of ground dal mix to the spice mix and grind to mix well. Step8 - Pour this spice/dal mix into the previously roughly ground dal mix. Mix well with a spoon or spatula. 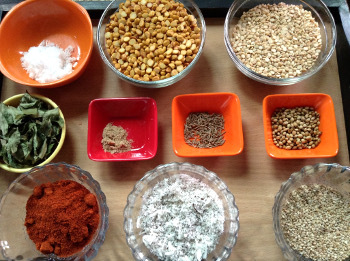 Now take this dal/spice mix in batches into your blender and grind to the consistency you want. The final chutney mix will look as in the image below. Here is our chutney pudi - chutney podi - dpicy lentil dal powder ready. Store in an airtight container. Use for months with plain rice, dosa, Idli, uttapam, chapati etc. This chutney should not be ground too fine. Quantity of tamarind(sourness) and jaggery(sweetness), should be balanced according to your taste. 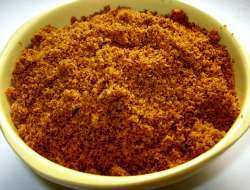 How to use chutney pudi - spicy dal chutney podi? Chutney pudi may be served with Indian breads such as jowar or bajra bhakri or akki rotti, chapati, dosa etc. Serve it with dhokla or idli and dosa. Just put a pinch of chutneypudi in your mouth when you feel like it. 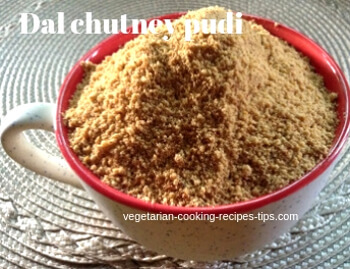 Chutney podi goes very well with methi or palak paratha. Spread a little ghee on a paratha/chapati. Sprinkle some chutney podi on the paratha and make a roll. You may pack these chapati rolls for lunch box. Chutney podi goes well with methi poori.